Same thing happened to me on my iPhone 6S on the latest iOS. I re-downloaded the Xcode project and tried again. It worked. Good luck, unique1o1! P.S. I also changed target build to iPhone and 9.1. Dunno if that helped me get a working version. deleting from my iPad, cleaning project in Xcode and rebuilding fixed this for me. Anyone who gets this to happen twice in a row, please post details (Xcode version, iOS version, etc.) Want to fix it! Happened to me twice in a row. Works great on my iPhone, but having trouble on iPad. This is non-retina? Wondering if the constraints are blowing up somewhere for that screen. Update - I had not fully deleted the previous version and two f.lux apps were present on the iPhone 5s. One worked and one didn't. Deleted the broken one and everything works fine now. Also saw f.lux team mention below that the problems I experienced with the app were related to the app not finding it's location. Very happy to finally have f.lux. On an iphone 5s I first got the black screen. Then I rebuilt and reinstalled it and get f.lux to open - but it doesn't work. I press preview or darkroom and the display brightness/color does not change in any way. I press Disable and it greys out the settings, and press Enable to re-display the settings - but they don't seem to have any effect. @peter2006 This is why it says iOS8+. 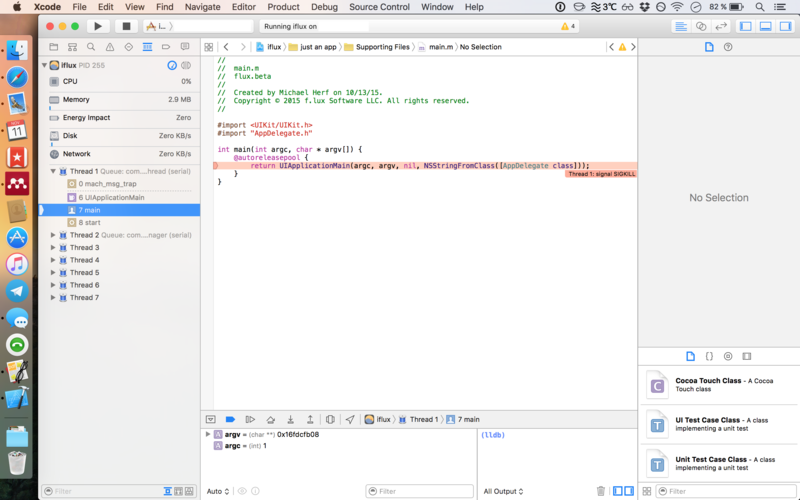 Anyone running on iOS9 get a stack trace or an error log? @herf Here you go. Is that what you're asking? warning: User supplied UIDeviceFamily key in the Info.plist will be overwritten. Please use the build setting TARGETED_DEVICE_FAMILY and remove UIDeviceFamily from your Info.plist. warning: All interface orientations must be supported unless the app requires full screen. I don't know where I can find an error log if at all? Wondering: did you happen to say 'no' to any prompts like location? This may mean the black screen is a crash and people are staying there because they're running in Xcode. I didn't even get any prompts, right when I start the flux app, the screen turns dark and nothing happens. The same here (iPad mini, iOS 9.1, Xcode 7.1.1, non-retina, MD528FD/A). Screen simply goes blank and Xcode displays the errors popsmisdeal posted. I'm getting the black screen too. No prompts or anything. I have this issue too on an iPad 3 (so Retina iPad) with iOS 9.1. I compiled with Xcode 7.1 on El Capitan. Just downloaded the project afresh, so no changes made. I never got any pop-ups on my iPad asking for any permissions. Flux is also not showing up in any of the permission views in Settings. Just first run it went black and never did anything besides showing the splash screen briefly. On my iPhone 5S with iOS 9.1 it works great by the way, so nice job! 0x2aa14f14 <+144>: mov r0, r5 <----------- SIGSTOP signal pointing at this line. I hope that helps :) If you need any more info, please ask. Worked great on my iPad Mini, but when I installed in my iPhone 5 or my wife's iPhone 5s, I got the same "blank screen on launch". No prompts at all — it briefly shows the Flux splash screen, then goes to black. Fortunately I can just press the Home button to get back to normal function of the iPhone. But no-go on F.lux itself. Black screen after brief splash screen as well. No prompts either, but home button returns to home screen. 2015-11-12 07:36:55.081 iflux[642:114264] Unable to simultaneously satisfy constraints. "<NSLayoutConstraint:0x154602540 'UIInputWindowController-top' V:|-(0)-[UIInputSetContainerView:0x154519c60] (Names: '|':UITextEffectsWindow:0x15453edb0 )>"
@peter2006 this happens when your location isn't found. we should add an error.. In the App settings, I can only set the permissions for background updates. It doesn´t show up in privacy > location, nor in the notifications area of the settings. Deployment Target in xCode 7.1.1 was set to 9.1 and iPhone, and permissions for my "developer" profile were given in profiles. iPhone 6 (iOS 9.1 build 13B143), trying to install via Xcode (7.1.1 build 7B1005). Sorry, but I'm not very keen in programming. What's funny is that yesterday I have successfully installed f.lux on my iPad 4 running the same build of iOS via the same Xcode version. I have an iPhone 5 running 9.1 and I also get the black screen after launch. By mistake I chose not to let it use my location, but now there is no option to allow it in Settings. And deleting, recompile and reinstall doesn't help unfortunately. I've got the exact same issue here. It works great on my iPhone 5S running iOS 9.1, but it fails to open (it shows the splash screen and goes to the black screen already mentioned) on my iPad 3 running iOS 9.1 as well. I didn't fail to give permission to anything or to trust my AppleID profile on Settings. Fortunately, I don't use my iPad much at night anyway (in fact, it's so heavy that I haven't used it much anymore since I've bought my iPhone), but it'd be nice to have f.lux on all my devices. I really suspect that exposure to backlights has affected my sleeping patterns lately, and f.lux, if it actually works, will be a godsend. I managed to successfully load this app to my iPad 3 (9.1) on my first try. No pop up requests for location or notifications were made, they were turned on automatically. Also, no prompt for security clearance to make the app open, but I knew to manually accept my profile. Unfortunately, when I attempted to load it to my iPhone 6 (9.1) Xcode threw its toys out of the pram. It crashed with a multitude of errors on two separate installs and I had to delete and re-download the files from here, twice. On my third go I got the app onto my iPhone, but after the splash page it went black. I could exit the app, no problem. I have deleted it and tried twice more. Each time I am left with the black screen and no explanation. I am looking forward to the fix. Oh, and using Xcode 7.1.1 (7B1005), downloaded today. That is three times I've successfully side loaded the app onto my phone, only for it to go black after the splash screen. I really am keen to get the app working you see! Tried 3 times but still get the black screen. No chance to allow/deny prompts. The developer profile is trusted. There is no options in the App Settings to allow location or notifications. I successfully loaded f.lux on my iPhone 6 Plus and friend's iPhone 5S, both running iOS 9.1, using the same computer and version of Xcode. But the my friend's iPhone 5C can't get past the black screen. I was finally able to successfully install on my iphone 6 plus. Command+R and it installed correctly. I was seeing this same behavior on iPhone 6, iOS 9.2 Beta 3 and Xcode Beta 7.2. I had to do the Product > Clean, then the build worked perfectly! The Product> Clean trick worked for me too. Now running on both my devices. I loaded f.lux on my iphone 6 running iOS 9.1 to test and ensure that this worked before I un-jailbroke my iPad to update it to 9.1. Worked flawlessly on iPhone, but experienced the black screen after install issue when loading on iPad. tl;dr - Doing product -> clean (⇧⌘k) then rebuilding (⌘r) fixed the issue. I had this experience today, I installed iFlux on my old iPhone 6, then switched to my new iPhone 6s and installed it receiving the same issue posted. After verifying the install, reinstalling, trying an alternate profile and verifying the location services I did the following. Create a unique copy of iFlux XCode code project for the new device and go through the process again. So the 4 things that need to be verified for the install to work properly. Fixed it for me too. Created a new xcode project for my ipad instead of using the same one as my iphone and gave it a different bundle identifier. rebuild and install to iPhone again.